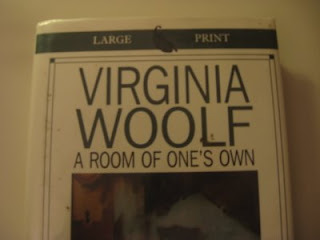 As I browsed through the large print section of the West Orange Public Library last Sunday, looking for a book about change, A Room of One’s Own by Virgina Wolf suddenly stood out in all its magnitude. The book was also in large print and free, so what was there to resist?. I had read the book in college but, well, not really, back then I was just trying to graduate and get the heck out of there. This time, I told myself, perhaps I could appreciate the message. I was stunned to read it, the beauty with which she composes her sentences, the way she carries the reader through her elegant stream of thoughts, her descriptions, and oh, yes, the message. In the book she says that between having the right to vote and having the right to money coming in every month without having to work for it she chooses the later. Virginia is interested in talent, not politics. She realized the importance of a woman having her own independence to be able to create. Today as I walked back from practice somewhere around 49th street I wondered if things would be different should she be writing the same book today. I wondered if in these days the room that is more necessary, even than the money, would be a psychic room of one’s own. I could not help but notice that with all the negativity in newspapers, the bombardment of advertising, and the strong propaganda of the media telling women that there is something wrong with them (we need botox, surgery, tons of make-up etc), having a room of one’s own may not even be enough. A mind that is free from cravings, from addictions, from low self esteem would perhaps be even more necessary these days, and yes the equivalent of the 500 pounds of those days per month would help. That was good, what happened?